An anti-G20 rally in Hamburg has erupted into a violent confrontation between police and protesters. 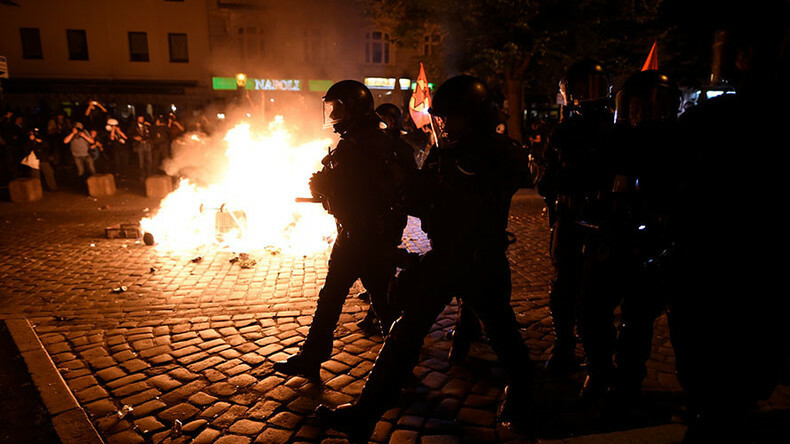 Dozens of officers have been injured by rioters as sporadic clashes on the streets of the German city continued into the night. “There have been offenses committed by smaller groups [but] we now have the situation under control... I was there myself, I’ve seen nothing like that before," Hamburg police spokesman Timo Zill told German broadcaster ZDF. The ‘Welcome to Hell’ anti-globalist rally started off relatively peacefully as activists marched through the streets chanting slogans and holding banners. Clashes begun in the early evening after roughly 1,000 anti-globalism activists, wearing face masks, reportedly refused to reveal their identity to the authorities. According to an official police statement, the trouble started when officers tried to separate aggressive black-bloc rioters from peaceful protesters at the St. Pauli Fish Market but were met with bottles, poles and iron bars, prompting them to use justifiable force. Police used pepper-spray on rioting protesters. Water cannons were also deployed by authorities and several people seemed to be injured as a number of people were seen on the ground or with bloody faces being led away by police. Footage from the scene also showed columns of green and orange smoke rising above the crowds. At least 76 police officers were injured in the riots, most, though, suffered light injuries, Bild reports. Five of them were admitted to hospital, a police officer told AFP. One policeman suffered an eye injury after fireworks exploded in front of his face. The number of injured demonstrators has not yet been released by authorities, DW German notes. As a result of the violence, organizers declared the protest over Thursday evening, but pockets of activists remained on the streets throughout the night. Police confirmed persistent sporadic attacks on security forces in the districts of St. Pauli and Altona. Damage to property has also been reported throughout the city. Rubbish bins surrounding St. Pauli area continued to burn late into the night, with the Hamburg fire department announcing that it answered almost 60 calls of raging fires after midnight. ‘Welcome to Hell’ organizers have accused the police of using disproportionate force against the activists. Up to 20 protesters were arrested in the clashes, Andreas Blechschmidt, one of the ‘Welcome to Hell, organizers told Bild. According to RT’s correspondent on the scene, Peter Oliver, one of the protesters’ grievances was that they received no clear directives from the police as to where they were allowed to march and found themselves kettled by officers in riot gear once they set off. The ‘Welcome to Hell’ march was staged a day before the two-day G20 summit begins in Hamburg. Police estimated that around 12,000 people attended the march. Earlier, German Interior Minister Thomas de Maiziere said there was a hard-core group of 8,000 leftist militants who were ready to use violence. Over 15,000 more officers has been dispatched to Hamburg from across the country, supported by specialist vehicles such as armored cars, water cannons carriers and helicopters. Protests have been banned in Hamburg’s inner city and on roads leading to the airport. Activists have accused authorities of suppressing their right to legitimate protest, but the city says it can take no chances with the safety of thousands of foreign delegates who will attend the G20, including world leaders such as Vladimir Putin, Justin Trudeau and Donald Trump. Thursday night’s clashes were preceded by similar violence which erupted on several occasions in the run-up to the high-profile G20 summit.